We can provide maps, plans, graphs, illustrations and diagrams of all kinds, including computer graphics, line drawings, photo-montages and hand-painted artwork. We also offer the professional copy-writing and editing services of a journalist who has written for UK national newspapers for over twenty years. Our clients include website designers, magazines, newspapers, book publishers, advertising agencies and printers. We also supply original artwork for use in PowerPoint presentations. ... our artists can produce the artwork and our writers can provide the words that will make the difference to your publicity material or presentations. Our award-winning team includes a professional designer with many years experience in magazine and newspaper design and a former Financial Times promotions editor. The Financial Times, Geographical Magazine, Independent Newspapers, Wayland Multimedia Group, Daily Telegraph, Guardian Newspapers, Discovery Channel, Choice Magazine and many smaller publishers, printers and website designers. Artsgraphique.com is based in St Albans, Hertfordshire, UK. 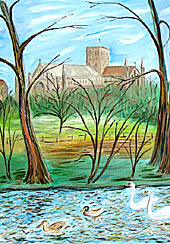 In addition to our graphics business we also offer for sale original oil paintings of scenes of St Albans by local artist Michael Roscoe. Click here to view oil paintings.